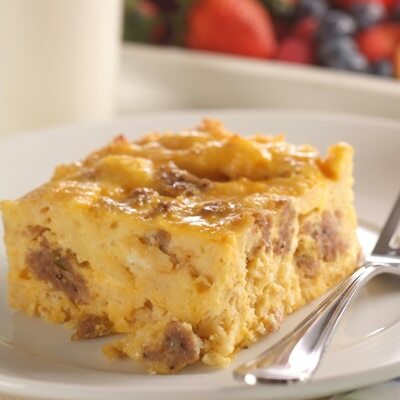 Put this hearty egg, cheese and sausage casserole into the oven early on a weekend morning and it will be ready by the time the whole family is up. An easy holiday brunch recipe! For extra variation try different cheeses, or add some ham or bacon bits. GREASE 13 x 9-inch baking dish. Place bread in prepared baking dish. Sprinkle with cheese. COMBINE evaporated milk, eggs, dry mustard and onion powder in medium bowl. Pour evenly over bread and cheese. Sprinkle with sausage. Cover; refrigerate overnight. BAKE for 55 to 60 minutes or until cheese is golden brown. Cover with foil if top browns too quickly. Season with ground black pepper.